These are the first moves from the fifth game of the 2002 Kisei title match between Ryu Shikun (Black) and O Rissei. White had just played and Black answered with to prevent his four stones being caught in a ladder. 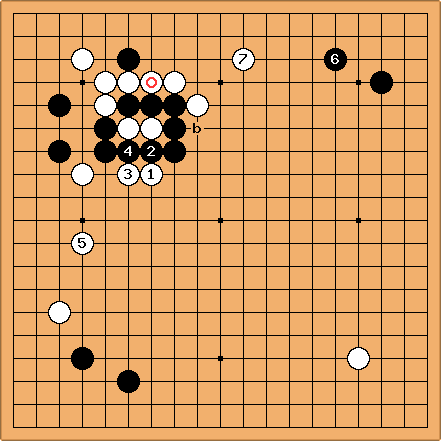 This move allows two kikashi at the marked points (in the game, O Rissei played these kikashi immediately). While replaying the game, I was wondering why Black didn't play here. 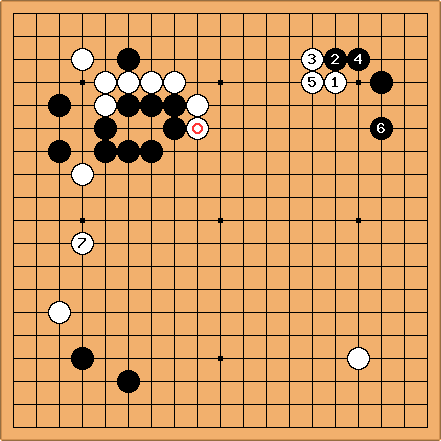 This leave only one kikashi at a or b. I suspect that Black decided that it was better to suffer the two kikashi in the game than to allow b, but it is not obvious to me that a white stone at b would be worth more than the two kikashi in the game. Dieter: My idea is twofold. First, in the next diagram is sente: Wh2 nicely develops the influence of the white group. The two moves in the second diagram, if answered, are kikashi: and have still to prove their value later and will be abandoned without regret ... but abandoned. Second, I'm not at all convinced that Black will let himself be forced. 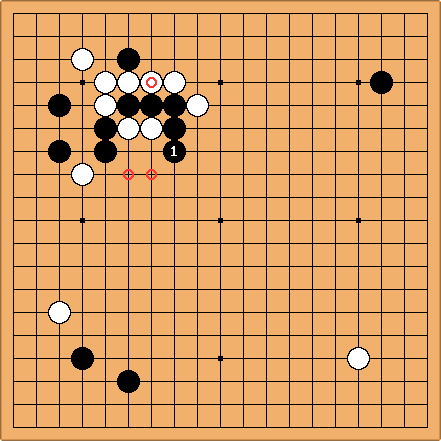 In the following diagram, Black adopts a fighting attitude. Maybe this is what Ryu wanted to invite O to do? AlainWettach Well, Dieter, as to your second point, the next moves showed that, at least in Ryu's mind, and were real kikashi. Those moves obviously help White on the left side. I am not totally convinced by the explanation based on the subtle distinction between kikashi and sente move, it is too abstract for me. 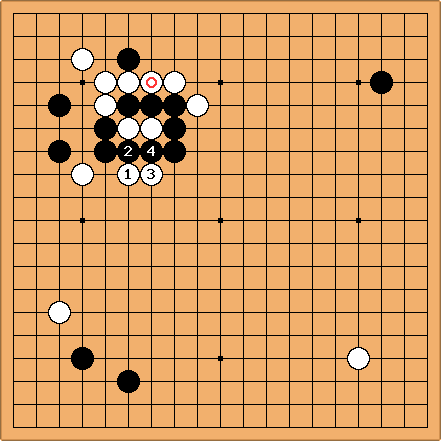 If White had been allowed the sente move at b instead of the two kikashis, I suppose she would have followed it with a move like in the next diagram. I would expect something like this to happen if Black had played at b. Is this really better for White than the game? I am not sure... Alternatively, White might play a high approach giving the next diagram. This possible sequence might be the solution. 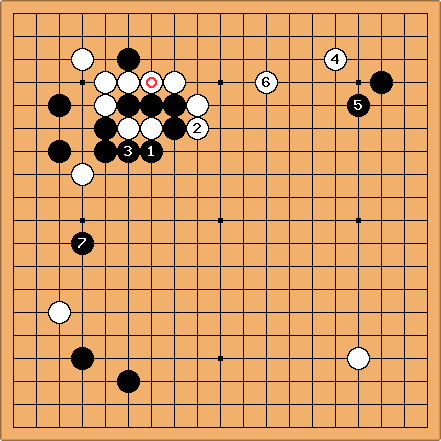 The stone might allow White to play tenuki after on the upper side and come back to play . This is only one way of playing, but a pincer on seems unreasonable and I see no other joseki ending in sente for Black allowing him to play at himself. Black could tenuki and play at immediately, but even if a stone at seems to give Black a promising position on the left, I think that the marked stone would work well with a 5-4 point joseki in the upper right corner. Who knows, maybe Rob van Zeijst will deal with this point in one of his next columns! JamesA: I think that after , Black will very much regret not answering the kikashi! The black group in the centre is large and heavy, and White will be able to do a lot with it. Also, White could later play at a, seriously reducing Black's territory. Alternatively, if Black plays at b to forestall this, White can go into the corner with c, then Black d, then maybe White e. I think Black has to answer the kikashi, and I think not giving White the sente play at b is reason enough to put up with the kikashi. Also, does Black's move threaten a cut? Which looks like a lot of black thickness to me, in return for not much white territory. Charles Matthews Not to speak of the ladder possibility at a. That in itself is enough to justify Black's decision, isn't it? Nick Hoover - 8 above seems quite passive for white. How about cutting instead? BobWhoosta: Keep in mind we may be looking at two possibilities in the position, one of which was chosen. It may be the two variations are equal but different, and had black eaten fried eggs instead of oatmeal for breakfast, it would have been a different game.